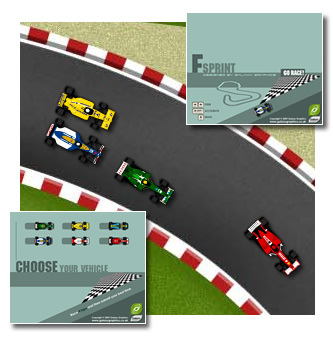 F-Sprint, a Flash Formula 1 driving/racing game by Galaxy Graphics. F-Sprint, a Formula One Flash driving game. Built around an extended and enhanced version of the popular Drift Racing game engine, F-Sprint features a much longer track and also its most interesting feature - opposition cars to race against. This version features the Brands Hatch circuit and the designs and colours of some of the most distinctive F1 cars from the last 20 years, but the game can be modified for other cars and circuits - it doesn't even have to be Formula One. Like all sports games, opportunities for customer / sponsor branding are plentiful, with the title screens, cars and the many trackside advert boards providing many places for information. The game uses the cursor keys and shift to control the car. Drive your chosen car around the rack as fast as you can, using the "TURBO" symbols to help your speed, and avoiding the "OIL" symbols. F-sprint also includes a built-in leaderboard displaying the top 50 laptimes on the game's opening screen, using a database with PHP.